Silly Mommy : Be afraid. Be very afraid. 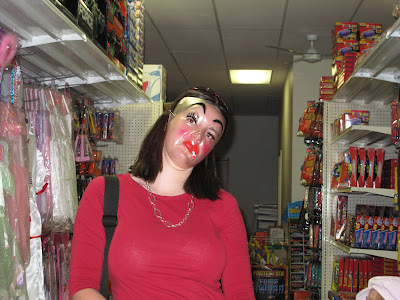 Just thought I'd leave you with one last image of Halloween horror. . .my best friend, Laura. That mask is creepy. It reminds me of the ones used in bank robberies. Did she get a face lift? If she did you might want to tell her it looks like the doc was tilted sideways or something cause it really does look scarry, but don't tell her I said scarry. Oh gosh that is pretty scary Holly!! Yikes! I think I just soiled myself a little. ;) Lookin' good Laura, lookin' reeaaalll good. You all are wack cuz I look good - dang good! HA! HA! HA! HEE! HEE! wasn't that mask just the BEST though? haha. you totally scared me when i saw you wearing it. and your children. Scary! Who makes these things? you two are so weird.